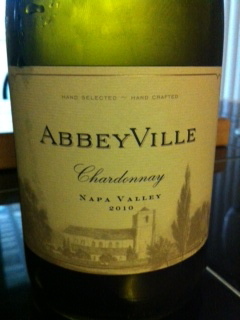 Aaron: I enjoyed the strong smell of oranges and lemon on this Chardonnay but felt the flavors were completely opposite. I personally notcied butter and cream frolicking over the taste buds and enjoyed the full, rounded flavor. This was smooth and very enjoyable but the slight tinge on the tongue after the swallow said there could be a little more aging for this wine. 89 points. This entry was posted in Under $10 and tagged 2010, California, Chardonnay, Napa Valley, White by aaronandteri. Bookmark the permalink.